Planting a tree is an action full of hope. We hope that our tree will grow and flourish, living out its life – which will certainly be decades, and perhaps even a hundred years or more – free of problems that threaten it. This is usually true, trees are remarkably tough, and most grow and survive without problems. But some don’t. Sometimes it is a major outbreak, like Dutch Elm Disease, that decimates a much-loved tree. Most often it is a lower-level disease that picks away at a particular type of tree, like the Verticillium Wilt that is spreading through maple trees these days. Other diseases look dramatic but do very little harm. So for gardeners, it helps to have some knowledge of diseases, to encourage the good, and separate the bad from the merely ugly. An earlier blog on Diseases of Maples has been a popular resource for our readers, so to continue giving that basic information, this time we are going to look at the diseases that pine trees may suffer from, which one’s matter, and what to do about them. Hey, That Doesn’t Look Good! Resin running down the trunk – If the bark is injured by diseases sticky resin often escapes and flows down the bark. This can even collect at the bottom of the tree, on the ground. As it dries it turns white and flakey around the edges of the flow, or it may dry completely into white or grey flakes on the bark. Dead shoots or branches – these might be anywhere in the tree – foresters often call them ‘flags’. Notice if they are on new shoots only, before the needles have had time to develop fully, or if a whole branch of mature shoots has died. Yellow needles – sometimes needles turn yellow, sooner than they normally would. Later they will turn brown, either completely or in bands. This shouldn’t be confused with the normal, season browning and falling of older needles. These will always be the last needles before the bare part of the stem. If they are, nothing is wrong, but if it is younger needles that are yellow, you could have a problem. Round swellings and growths on the stems – these are called ‘galls’, and although unsightly they are rarely dangerous to the tree. Several different organisms can cause them. You can see there are not a lot of different things that will show you there is a problem, so knowing what the problem actually is depends a lot on what kind of pine tree you have. If you don’t know, ask around your neighbors, often they will know, or take a branch – with some cones if possible – to a local garden center and they may be able to help. There are good resources on the internet too. You need to know how many needles there are in the bundles on the stems, and having a mature cone helps a lot. Deciding on what disease is affecting your tree is a combination of what signs you see and what type of pine it is, since many diseases are specific to one or a few different species. There are a number of diseases that can be seen on different pines, but these are the most common of the serious ones, that can cause major damage or death. If you live in the north-east, you might have a white pine tree. These lovely native trees are usually easy to grow, but there is one serious disease that can attack them. This fungus attacks side branches, which die – creating ‘flags’ – and then spreads along the branch until it meets the trunk. There a canker forms, and sap runs down the bark. Once the disease reaches the trunk there is nothing that can be done. Over a few years all of the tree above that spot will die. If it happens high in the tree it will in time create a picturesque dead top, for birds of prey to use as lookouts, but if it is lower down most of the tree will be killed – it’s the luck of the draw. To prevent this disease, keep a close watch on your white pine. If you see small dead branches, remove them, cutting at least a foot further down, into healthy parts. The fungus spreads ahead of the dead sections. If you can make it more than a foot, even better. This will keep the disease away from the trunk, and you will only get minor branch loss. If you see new shoots dying on your pine tree in spring, and sap oozing from the area where those new shoots develop from, then think about what kind of pine this is. If it is Austrian pine, or Ponderosa Pine, this is probably Diplodia Tip Blight (also known as Sphaeropsis). Give the dead needles a gentle tug, and if they come out easily, that confirms it. Over time more tips will die, killing whole branches, usually lower down on the tree. A badly-infected tree will not have much life left in it. This disease can be controlled by spraying with suitable fungicides (copper sulfate is a suitable organic spray, and propaconazole or thiophanate-methyl are also effective) over a limited period in spring, when the buds are swelling, and again before the needles fully expand. For a larger tree you will probably need to bring in an arborist. This is certainly the most serious pine disease around, because it strikes and kills so quickly that little can be done. This disease is also unusual because it is caused by a microscopic organism called a nematode, and it is carried from tree to tree by beetles. The first sign is a greying of the green color of all or most of the needles, followed by yellowing and then browning. You may see the signs in spring, and by late summer or fall the tree will be completely dead. If you see browning, but the tree stays alive for months or years, it probably isn’t Pine Wilt. The nematodes have blocked all the water-transport system of the tree, and it dies from lack of water. However, watering it will do no good, because the blockage is inside the tree. There is no cure for this disease, and dead trees should be removed and burned or chipped straight away. It takes a plant laboratory test to confirm this disease, and these are available – check your local university or college. Austrian, Scots, and Japanese Red Pine are the pines most usually affected. Don’t replant pine as a replacement – choose a spruce, fir, or hemlock instead. 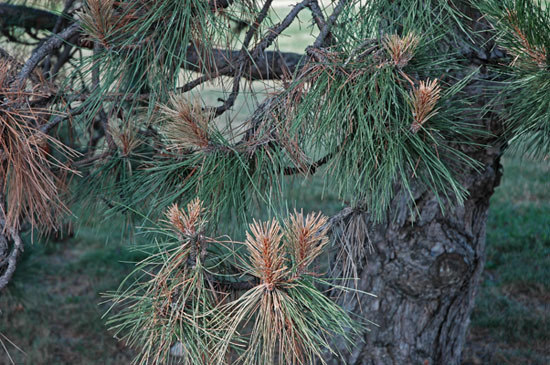 There are numerous other pine diseases, but they are mostly just unsightly, rather than lethal. Good management, such as not changing soil levels and covering the roots with fresh soil, can go a long way to keeping your pine trees healthy. I think I have a Desert Pine variety here in Mesa Arizona. Bought as a small 1 gallon 6 years ago I put in a 5 gallon and then in the ground 3 years ago…At seven feet it’s green, but just recently (two to three weeks) the newer green needles have been shriveling or curling up to gnarly ends. Internet has no solution. Do you have an idea? Sorry, I am not too familiar with growing in Arizona, so I don’t think I can help much. If there are’gnarly ends’ are you sure they are not being eaten? Shriveling suggests a root problem (dryness? Too wet? ), and there are several types of caterpillars and sawflies that feed on pine needles.